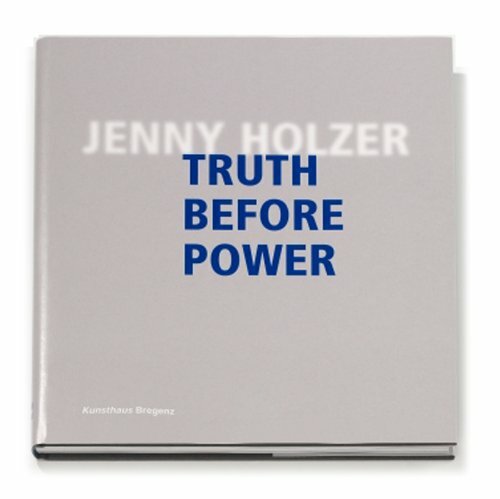 The politics of U.S. foreign policy in the Middle East is the subject of Truth Before Power, Jenny Holzer's recent Kunsthaus Bregenz project. The complicated dialectic of decision-making and public debate, as it has unfolded through the presidencies of Ronald Reagan, George H. W. Bush, William Jefferson Clinton, and George W. Bush, is explored in texts devoted to such issues as the international trade in arms and oil, the war on terrorism, 9/11, the FBI and CIA, and Congress's oversight of the intelligence community. For the most part, the installation's text has been taken verbatim from U.S. government documents--many of which were classified at the time they were written. Under the landmark Freedom of Information Act passed in 1966, all are now public record, though some remain heavily redacted. This illustrated catalogue includes selections from declassified U.S. government documents, Henri Cole's poem To the Forty-third President, and highlights from Holzer's own writing. Color photographs document Holzer's installations at the Kunsthaus and the Johanniterkirche in Feldkirch, and the eight xenon light projections staged in Vorarlberg.